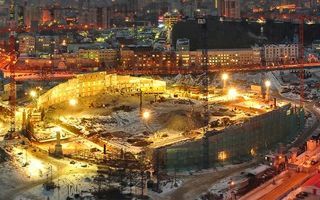 Today, thanks to the brilliant photographic material by Yekaterinburg photographer Umformer, we’re able to show you progress on the construction site in easternmost city of the 2018 World Cup. Yekaterinburg was one of the last cities to see construction begin and there’s a good reason for it. For years it was debated how to preserve the monument-listed outer walls of the stadium while also reconstructing it entirely. As our frequent readers may remember, there were several completely different ideas. One suggested hiding the walls inside a much wider new façade. Another envisaged the walls reconstructed as entry gates away from the stadium itself. And finally, along the final concept, distinctive yellow facades are left mostly intact, while the new stadium will be pushed inside, into a very tight compact location. As the design phase took long, it wasn’t until early 2014 that demolition of the old stands and cover began. By November none of the concrete structure remained, while the protected outer walls were became surrounded by 6 tall cranes. New stands with no running track will be incorporated into the circular blueprint of the stadium. Due to its limited size (57,000 square meters) the stadium had to be designed rather tall, while additional tubular sections are to be temporarily added for the duration of FIFA World Cup outside the ground. After the tournaments they could be removed, reducing capacity by up to 12,000 seats. However, recent discussions include retaining the additional seating and not dropping capacity much after the World Cup. From the outside the old yellow walls will be combined with grey mesh. Its neutral colour will be possible to change at night with dynamic illumination. On top of the whole building a large circular canopy will be hanged, hovering 45.5m above the field.